With the opening of the 2017-18 school year, Carmel Unified started implementing a district-wide infrastructure project called “Project 2020,” designed to bring better Wi-Fi to all the district classrooms, as well as connecting all the buildings—internally and out to the internet. To date, the district has spent nearly $600,000 on the project since its creation. 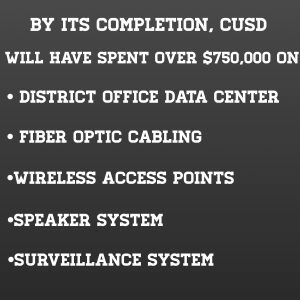 Devices like fiber optic cabling, a virtual data center, and wireless aspect points have been purchased and installed by the district. All of these, to students, may sound confusing. The process by which these decisions are made is rather meticulous. The district first must nominate members to be in a committee that will then hold formal meetings on school funds. It’s there that crucial funding decisions like Project 2020 are made. “The Wi-Fi access points in an enterprise-level situation, like a school, can cost 10 times what a home system costs because of the added demands and complexity,” Behan adds. This is one of the reasons why systems in districts are so expensive, and funding is needed. Because the district qualifies for a federal funding system called E-Rate, the cost of Wi-Fi access points for the district reduces from $175,000 to almost half that. Despite the recent purchase of these basic materials to improve the district and CHS, the exact purpose and meaning of them can be perplexing. To begin with, it’s important to note that each school in CUSD possesses what’s called a “main distribution center,” in which signals are passed to the internet. The recently purchased fiber optic cables serve the purpose of connecting each building to the main distribution center. “The main purpose of the upgrades is to address Wi-Fi connection and speed issues at all the district’s schools,” adds Behan. 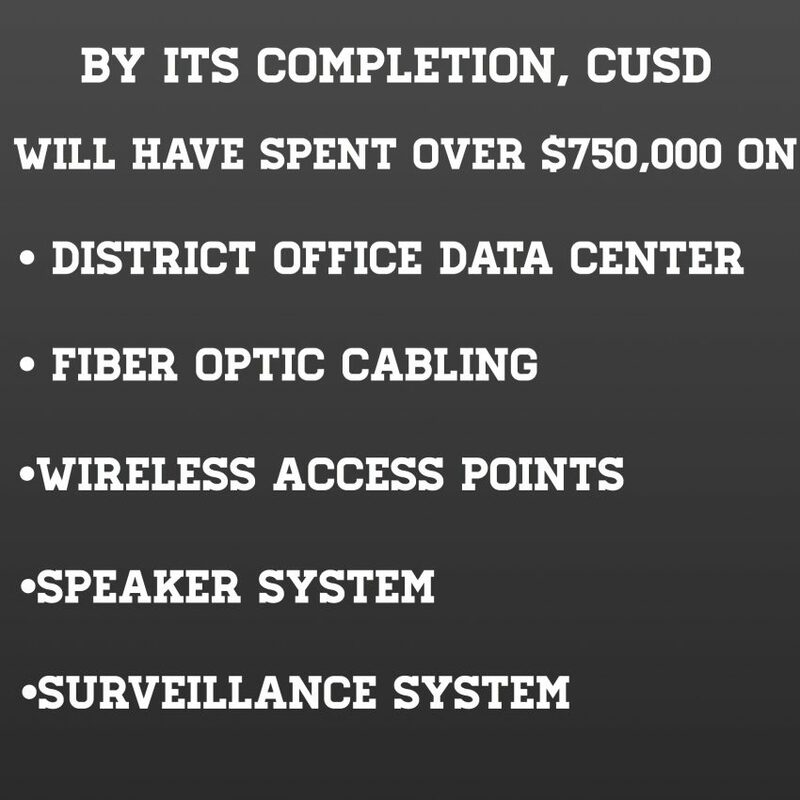 The fiber optic cables will provide the “backbone” of the network and are capable of faster speeds than what CUSD used before the recent upgrade: copper cables. Wi-Fi access points, which have also been recently installed over the summer, allow classrooms to connect to school Wi-Fi. In the past, Carmel Unified has used one Wi-Fi access point per two, sometimes three classrooms. With the new inclusion of access points, the district now has about one access point per classroom. Matheson additionally taught a course last year with the CHS science department and witnessed the crashes and lack of functionality of key district websites. This year, Matheson is beginning to witness a change in the connection to Aries, the district’s grading site, and Moodle, where teachers house their homepages. Because of this, students, teachers and staff should be receiving better Wi-Fi connection since last school year. However, Wi-Fi access points are still being installed in the outside areas of CHS, and changes will be made throughout the school year as the installation approaches completion. Changes will continue to be made indefinitely for Carmel, as the technology of the district will constantly be advancing. “We had some minor issues at the beginning of this year with new students to the district and their ability to log in to a couple things, but that resolved itself pretty quickly,” says Kevin Buran, a Biology teacher at CHS who has witnessed some change in the speed of internet this year. Since the beginning of the school year, Wi-Fi access points have been installed by district faculty all around the school, allowing teachers like Buran to proficiently work with students. Despite the installation of access points, students still find themselves struggling to gain Wi-Fi access on their mobile devices. Some classrooms in corners of the school have worse connection for students, while others have Wi-Fi that is easily accessible. With the recent installment of the virtual data center, the district should be witnessing changes in the efficiency of the Aeries and Moodle websites. Students of all classes during the 2017-18 school year found themselves at times not being able to get into either website, especially on Friday mornings, when quizzes and tests were scheduled. The inability to access curricular materials led to the installment of a new virtual data center, in which both websites serve as “applications” that are hosted on virtual servers for increased reliability. As students and faculty alike approached the end of the 2017-18 school year, the problem of technology at Carmel High was voiced heavily. This year, the school can expect an improved, quicker and overall easier approach to the technological aspect of student life at CHS.